A drought of horror comics stretched after the 1970s revolution that had been spearheaded by Tomb of Dracula and the edgier 1990s titles like Ghost Rider and Morbius. The 1980s were pretty sparse in terms of horror comic books, in particular for Marvel Comics as DC Comics had their acclaimed and award-winning Swamp Thing title written by Alan Moore. However, one title, Dr. Strange, although more supernatural than horror, kept an eye on the darker corners of the Marvel Universe. Doctor Strange, Master of the Mystical Arts and Sorcerer Supreme of the Marvel Universe, finally turned his attention the hordes of vampires that plague the Earth. 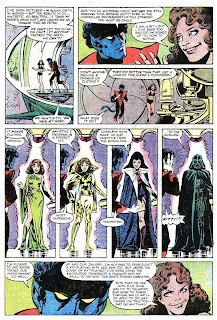 The Lord of Vampires and the Sorcerer Supreme had clashed in the 1970s where Strange was victorious and had left Dracula for dead. 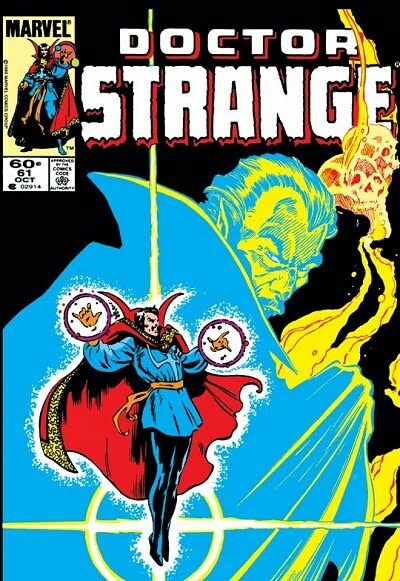 Veteran 1980s comic scribe Roger Stern wrote The Montesi Formula story arc running through Doctor Strange #58-62. 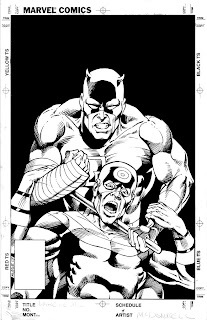 What’s refreshing about this story is that while it’s an event that affects the large Marvel Universe, it doesn’t feel like one of the events that currently plagues comic books today like Secret Invasion or Blackest Night. 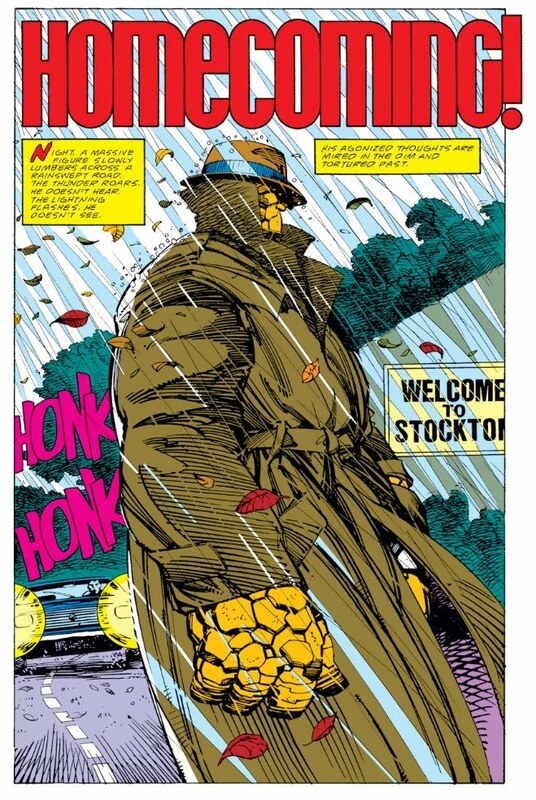 The art stands up quite well with Dan Green and Steve Leialoha providing the moody, action-filled panels. Issue #60 stands out with horror slamming into the Marvel Universe as the vampire hordes of Dracula siege Avengers Mansion as the Lord of Vampires tries to get his hands on the famed mystical tome, the Darkhold. The Darkhold contains a spell, The Montesi Formula, that can purge the planet of all vampires. The storyline culminates with issue #62 bringing together all the carefully woven story threads. In a fine tribute to the 1970s Tomb of Dracula, Blade and Frank Drake are called upon to defend Strange from Dracula as the Sorcerer Supreme attempts to read the Montesi Formula. If you love vampires, mystical cults, dark sorcery, and the Marvel Universe, this story is worth tracking down. This storyline as well as the 1970s crossover is available in the Dr. 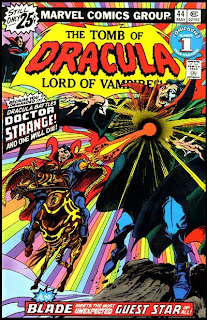 Strange vs. Dracula: The Montesi Formula Trade Paperback. This 1980s gem, written by Stern and drawn by a young Mike Mignola (Hellboy), is truly worthy of the term Graphic Novel. In this story, the Vishanti, a triumvirate of powerful mystical beings, summon the Earth's greatest mystics, including Dr. Strange and Dr. Doom, and put into motion a combat ritual to determine who will be the Earth’s Sorceror Supreme. In the end, only Dr. Strange and Doom are left standing, but it's Strange who prove himself worthy. 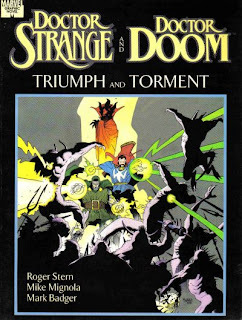 As the new Sorceror Supreme, Strange must grant Doom a boon. Doom requests Strange's aid to rescue his mother's soul from hell and the demonic entity Mephisto. 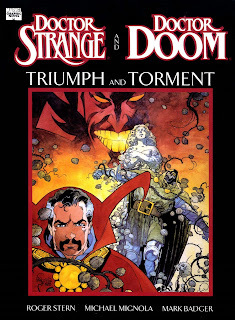 This clever tale not only retells both origins of Doctor Strange and Doctor Doom, it carefully explores their motivations and true character. Particularly with Doom, who’s been branded as one of Marvel’s greatest villains, proves to be one of the more rational villains as he genuinely believe what he is doing is right rather than being evil. This graphic novel might be difficult to find as it’s been over twenty years since its original publication (it was available in both softcover and hardcover), but it's well worth your efforts. It's amazing to see how Mignola's art improved in just a few years. Fantastic Four #293 was John Byrne’s final issue as writer/artist with Roger Stern and Jerry Ordway pinch hitting in issues #294-295. Fantastic Four #296 was the Fantastic Four’s 25th anniversary issue the pinnacle in the Marvel 25th anniversary celebrations. As for what might have been… An interview in Comics Feature #44 (published in May 1986) with John Byrne apparently took place before his decision to leave the Fantastic Four. "In the 25th anniversary issue I'm going to be doing essentially the same thing in that you'll be able to pick up on these guys even if you've never seen them before. But I also want to fill it up with all kinds of little, almost subliminal, fanish type stuff that people will recognize as being references to earlier stories." "The basic premise is that Reed, Sue, Johnny and She-Hulk are out in California and they go out to the old rocket base in Central City. It's all grown over with weeds and looking pretty scraggy, the way Cape Canaveral is these days. 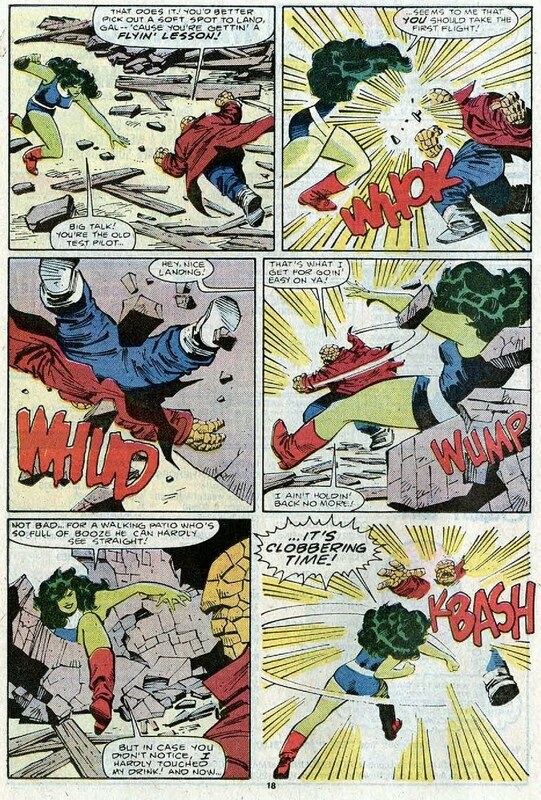 The first part of the issue, as it now stands, will be a retelling of Fantastic Four number one, as they tell their origin to She-Hulk -- their first battle with the Mole Man and all that." But things start happening as the world is assaulted by wide-ranging earthquakes, which Reed Richards pinpoints as having their source at Monster Island. But Monster Island blew up at the end of FF 1 -- or did it? "So they go tripping off to Monster Island, or where it used to be, and discover that what is now there is basically a very large hole -- into which sea water has been pouring for years. It's been gushing down into the tunnels that the Mole Man appropriated from the Deviants and has managed, in many cases, to work its was quite a ways down into the vicinities of the center of the Earth. As a result, it's coming back as super-heated steam which is causing vast pressures to build up underneath the crust of the Earth -- which is what's causing all of these giant earthquakes, globally. "They are about to do what they can to undo this damage when... the Mole Man turns up. He's still there, still lurking around, and he's got all kinds of things happening involving that group of outcasts he put together. "The Mole Man has discovered that the Valley of the Diamonds is not in fact a natural phenomenon. The diamonds are mystical, and he's discovered that if he melts down the diamonds he gets this glib which, if you immersed yourself in it, you are transformed into whatever you are in your heart of hearts. “What follows is a story in which the FF try to avert final disaster for the world while the Mole Man is convinced that they're just there to make trouble for him again. 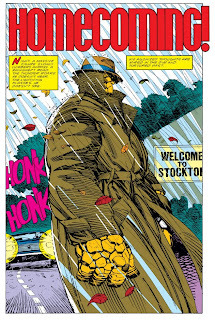 But if that's not enough (remember this is a triple-issue filled with triple-threats and triple-promises), an important former member of the FF turns up there -- the Thing. Certain changes planned for the Thing, which have not yet been revealed but will have come to pass by late summer, will have driven him to Monster Island, convinced that it is the only place for a monster such as himself. There, the Thing comes face to face with what he is in his heart of hearts. “The Thing is reunited with the FF in this adventure, and at the end, "We get back to New York for an anniversary party! 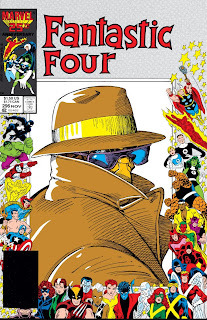 It's kind of a separate story at the end of the issue which unveils the FF's new headquarters and has virtually the entire Marvel Universe guest-starring, including folks from Marvel." Hyperion! Power Princess! Dr. Spectrum! The Whizzer! Nighthawk! What happens when the greatest heroes of an alternate world institute the Utopia Project, vowing to abolish war and crime, to eliminate poverty and hunger, and to cure death itself! Can they possibly succeed? And when do heroes stop being heroes? Mark Gruenwald explores the ethics of heroism in his best-known story. Guest-starring Captain America and featuring the end of a world at the hands of the Scarlet Centurion! 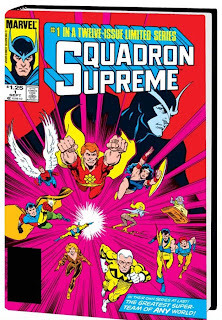 Collecting SQUADRON SUPREME (1985) #1-12, CAPTAIN AMERICA (1968) #314 and SQUADRON SUPREME: DEATH OF A UNIVERSE. When the Dark Phoenix rises, suns grow cold and universes die! Gathered by Charles Xavier, the X-Men have dedicated their wondrous abilities to protect mankind -- even those who hate and fear them. Now, these incredible individuals embark on an adventure that will span the expanse of the cosmos. One of their own, Jean Grey, has unwittingly attained power beyond conception -- and been corrupted, absolutely. The X-Men must decide: Is the life of the woman they cherish worth the existence of an entire universe? 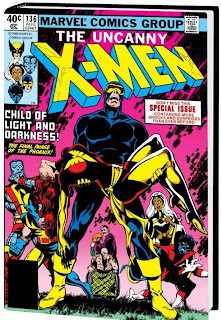 Collecting X-MEN #129-138, CLASSIC X-MEN #43, BIZARRE ADVENTURES #27, PHOENIX: THE UNTOLD STORY and WHAT IF? (1977) #27. The Silver Surfer was the creation of Jack Kirby who had slipped him into the first Galactus epic that ran through Fantastic Four #48- 50. Kirby’s Surfer was a grand cosmic figure who was noble, confident, and unfeeling. It was Stan Lee who infused the Silver Surfer with human character and brought him to life. A scientist named Norrin Radd offered up his life in servitude to prevent a world-devouring entity called Galactus from destroying his home planet. Imbued with the power cosmic, Radd became the Silver Surfer, herald of Galactus, and sought out planets that could temporarily satiate his master’s all-consuming hunger. The Silver Surfer would eventually discover the Earth and lead his master here. However, the Silver Surfer became enamoured with humanity and found it worth fighting for. He betrayed Galactus and helped the Fantastic Four drive him off. However, he paid a devastating price for his actions. 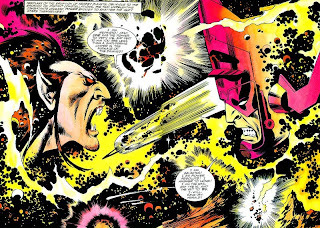 Galactus bound him to the Earth and forever denied him the freedom of space. The Silver Surfer is Stan Lee’s ultimate angst-filled solitary figure. The Surfer chose to give up everything he had to save the Earth and yet mankind, fearing his strangeness and power, drives him into a further exile. 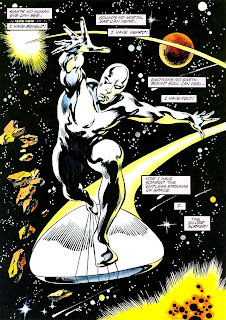 Forever denied the pleasures of traveling through the cosmos, the Silver Surfer spends a lot of his time contemplating and lamenting his situation, much like another tragic figure, Hamlet. The premise of the story is pretty straight forward. 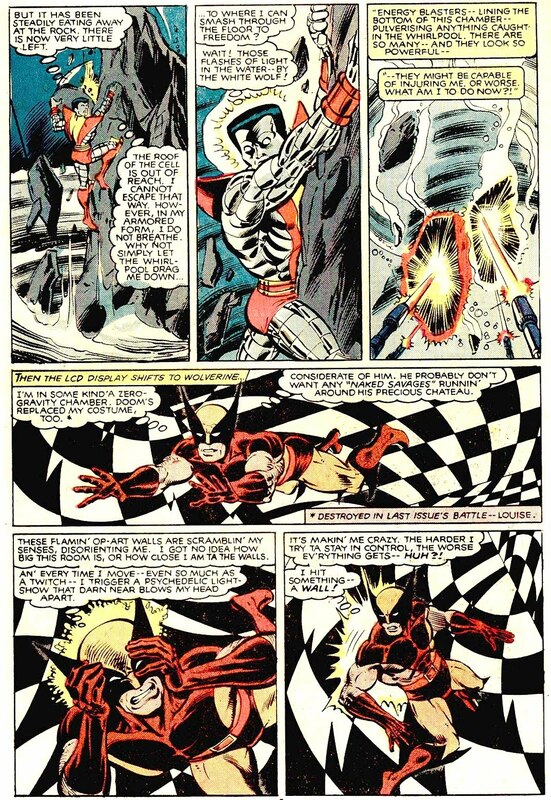 Mephisto, a Satan figure of the Marvel Universe, makes another attempt to get his hands on the Silver Surfer’s soul. 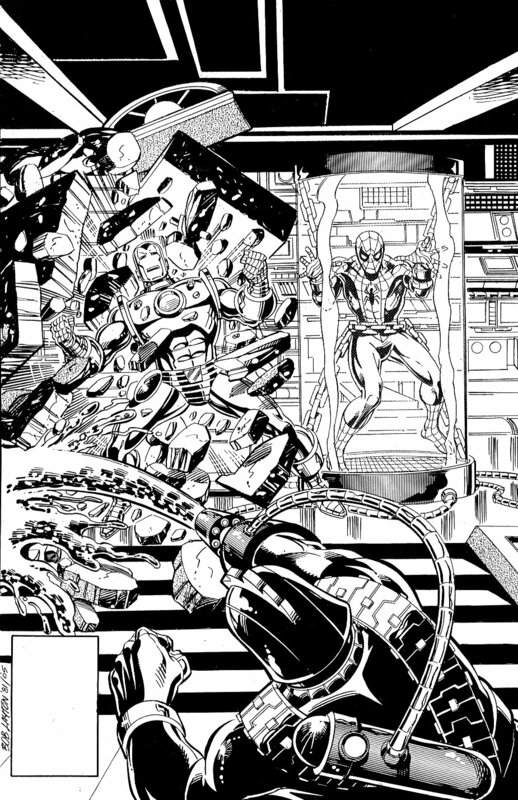 This time he uses Galactus’ herald Nova, for whom the Silver Surfer has strong feelings, as bait for the trap. 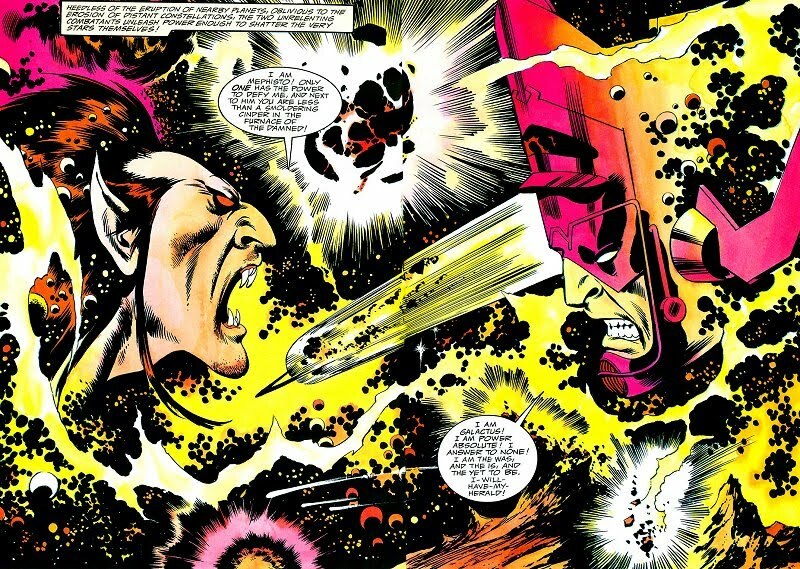 The stakes of this game get higher when Mephisto’s scheme draws the attention of the world devouring Galactus. While all of Stan's word bubbles and narration might seem over-the-top at a glance, it's not that bad once you get into it! Face front True Believer! The Avengers' Ace Archer on his own! A great way to show character is through deconstructing. 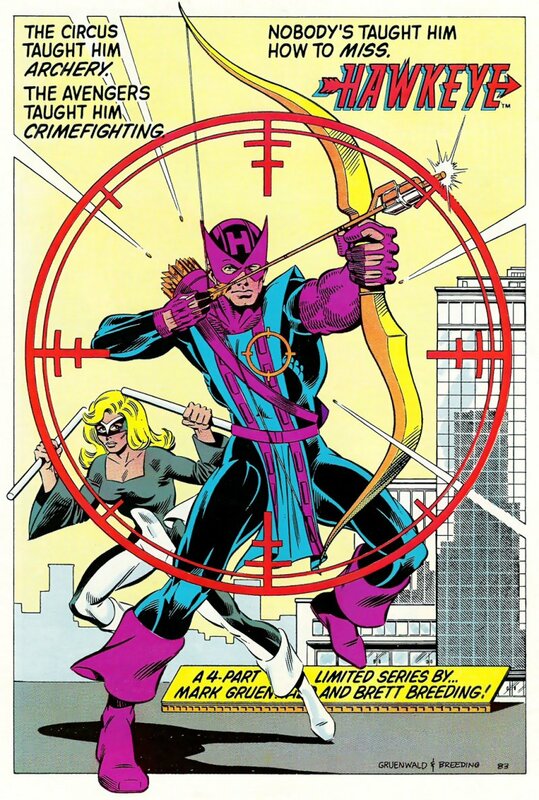 Mark Gruenwald, in a single issue, takes Hawkeye down to one of the lowest point in his career. At the beginning of the issue, he’s the security head for a Cross Technological Enterprises and by the end of it, he barely survives a toxic waste death trap, gets fired, and is dumped by his girlfriend. Hawkeye does find an ally in Mockingbird and with her help, he sets about on the road to recovery. He even gets a new costume out of the deal. With issue #2, they fend off the assassin called the Silencer. The miniseries gets a bit out of hand with issue #3 and #4 when two ridiculous assassins, Oddball and Bombshell, defeat and capture Hawkeye and Mockingbird. The evil mastermind behind this secret project turns out to be an obscure villain named Crossfire. 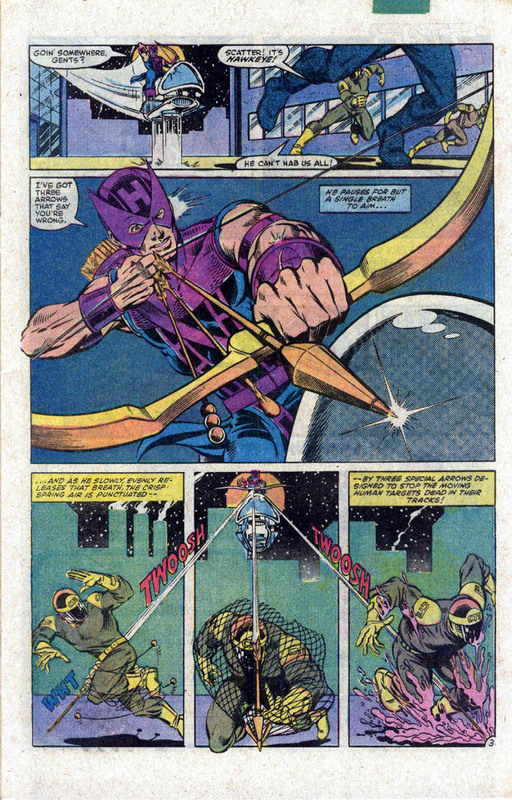 Crossfire gloats over the captured heroes and reveals his master plan to eliminate the Avengers and other heroes that would attend Hawkeye’s funeral. 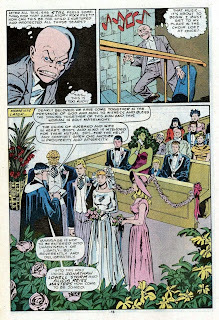 Hawkeye and Mockingbird conclude their whirlwind romance by getting married at the end of issue #4. There’s nothing really innovative in this miniseries. 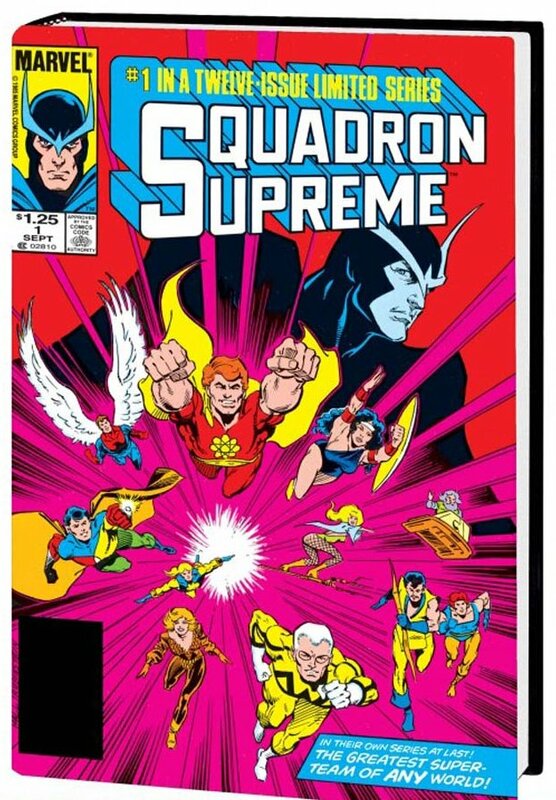 This effort pales in comparison to Gruenwald's magnus opus, Squadron Supreme. The story throughout this miniseries is pretty much a paint-by-numbers job, but does succeed in giving Hawkeye a bit more of the spotlight. Even to this day, Hawkeye is still a secondary character with a string a failed ongoing series. Gruenwald's art seems to loose energy by the end of the miniseries. The first issue really shines and a lot of the artistic credit goes to Brett Breedings. Unfortunately, Danny Bulanadi replaces Breedings as the inker on the miniseries with issue #3. I really enjoyed Breedings’ inks as I felt he truly lived up to the name embellisher. 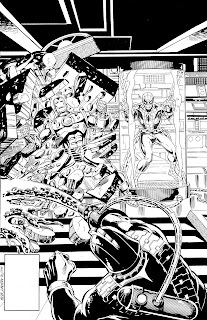 Bulanadi’s inking efforts in my opinion overpower Gruenwald’s penciled art. You can see a similar effect in the Price Namor Sub-Mariner miniseries. - Hawkeye and Mockingbird are next seen in Avengers #239. - Mockingbird first appeared in Marvel Team-Up #95. 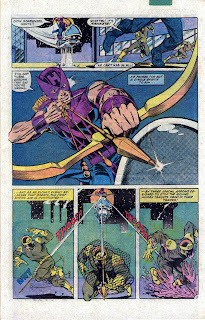 - This miniseries introduces Hawkeye's rocket sled which he takes with him into the West Coast Avengers miniseries. 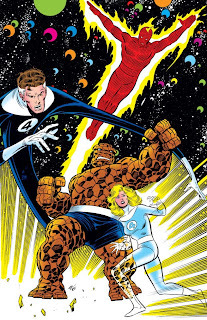 Marvel followed up the big 25th anniversary issue of the Fantastic Four (#296) with a new creative team: writer Roger Stern and artists John and Sal Buscema. Loving their work on the Avengers, I was excited to see their take on Marvel’s First Family. 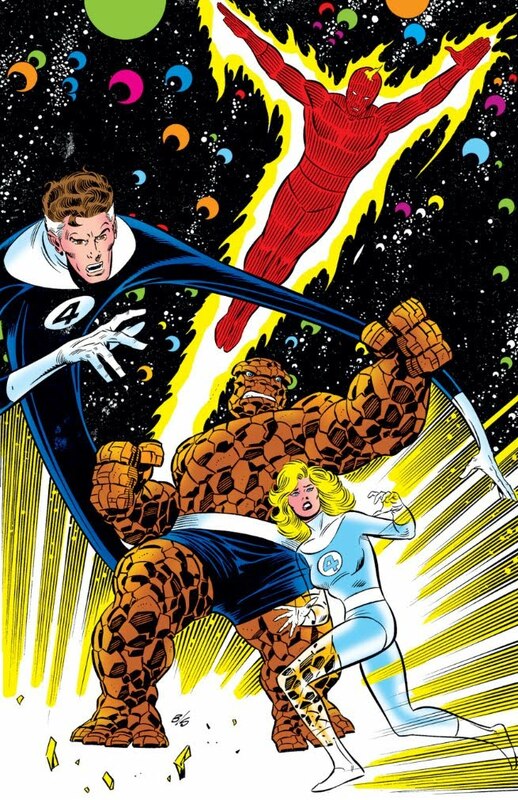 Fantastic Four #297-298 featured the return of the Thing to the team’s line-up. Johnny, out of the blue, decides to propose to Alicia and she’s accepts. And of course, this really threw the Thing for quite a loop as he still had unresolved feelings for Alicia. 4 Freedoms Plaza was introduced in issue #299 as the team’s new headquarters built on the same lot where the Baxter Building stood. 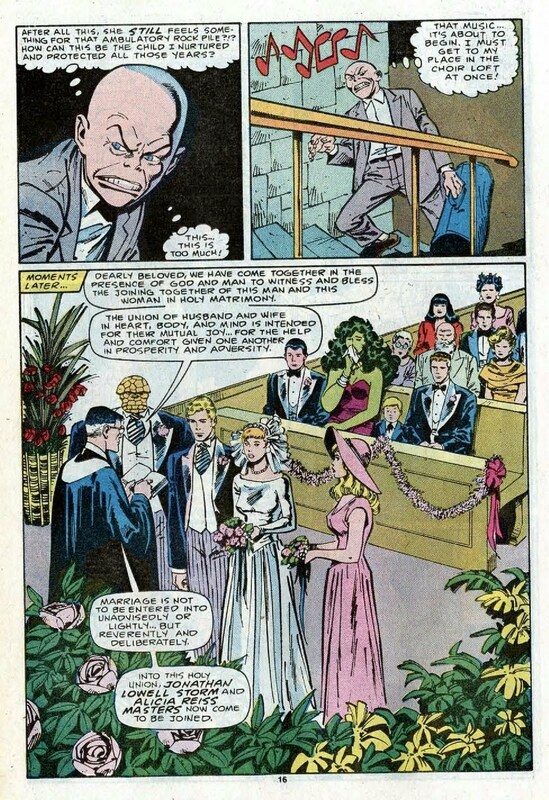 Ben also decided, with some convincing from the She-Hulk, to stand beside Johnny at his wedding to Alicia. Fantastic Four #300 was a regular-sized issue, probably due to the fact that issue #296 was a 64-page spectacular. This marriage issue turned out to be a pleasant read. As expected, the Puppet Master plots with the Wizard and the Mad Thinker to strike against the Fantastic Four. However, seeing that his daughter is happy, the Puppet Master decided to turn against his accomplices and foil his own plan. Unfortunately, the Stern and Buscema run I had been excited about based on their amazing Avengers run came to an abrupt end after only four issues. 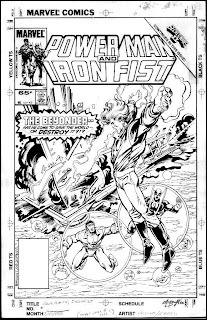 In fact, John Buscema had grown rather tired of drawing super-heroes and Fantastic Four # 309 would be his last issue on the title. 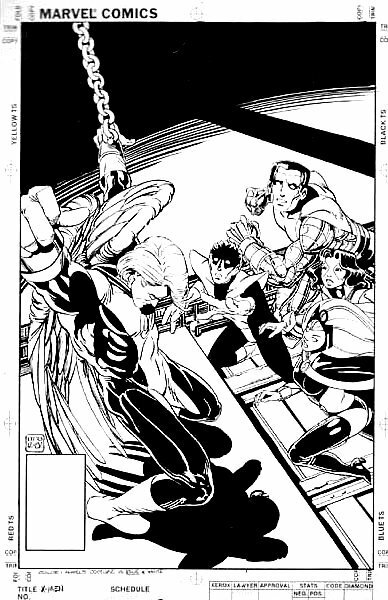 After John Byrne’s departure, Brent Anderson (now famous for his work on Kurt Busiek’s Astro City) did the fill-in art in Uncanny X-Men #144 while Dave Cockrum prepared for his return to the title he co-created four years earlier. Unfortunately, Cockrum’s art was too stiff and dull in comparison to the Byrne and Austin’s art work. The X-Men got involved in a personal battle between Arcade and Dr. Doom. Professor X actually called in the reserve X-Men like Ice Man, Banshee, Havok, and Polaris to help. The story line climaxed with a cheesy plot thread that played off the Dark Phoenix idea but was focus on Storm. Cyclops was brought back from his leave and returned to the fold as the team ramped up for a major confrontation with Magneto. Uncanny X-Men #150 forever changed Magneto’s character. He threatened the world and willfully destroyed a Soviet sub. His actions gave a wake up call to the world reminding them of the threats all mutants posed. Under Claremont’s watch, Magneto become a multifaceted villain. Claremont rooted Magneto’s motivation into his childhood trauma watching his family die in Nazi death camps in Auschwitz. He refused to let such atrocities happened again and to his own kind. Now he had the power to prevent the whole scale slaughter, but may have gone to far to protect his own race. 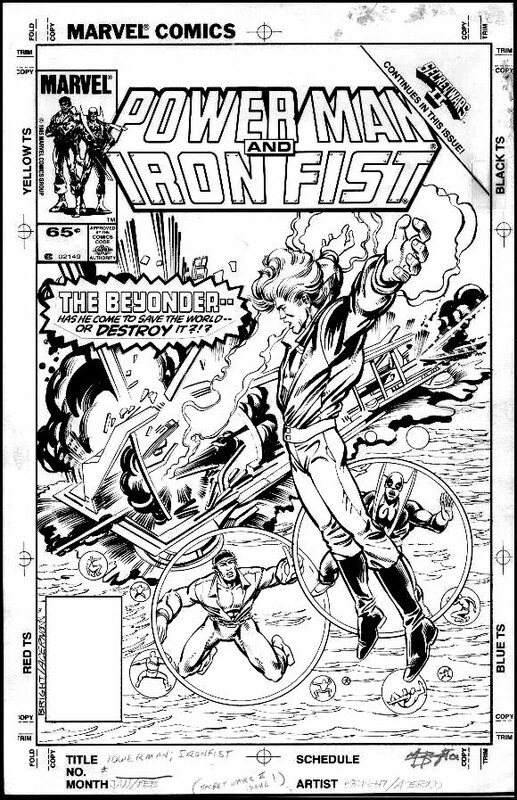 A couple fill-in issues by the underrated Bob McLeod (who would go on to draw the New Mutants), which that featured the return of the Hellfire Club’s Inner Circle and their reconstruction of the Sentinels, followed. 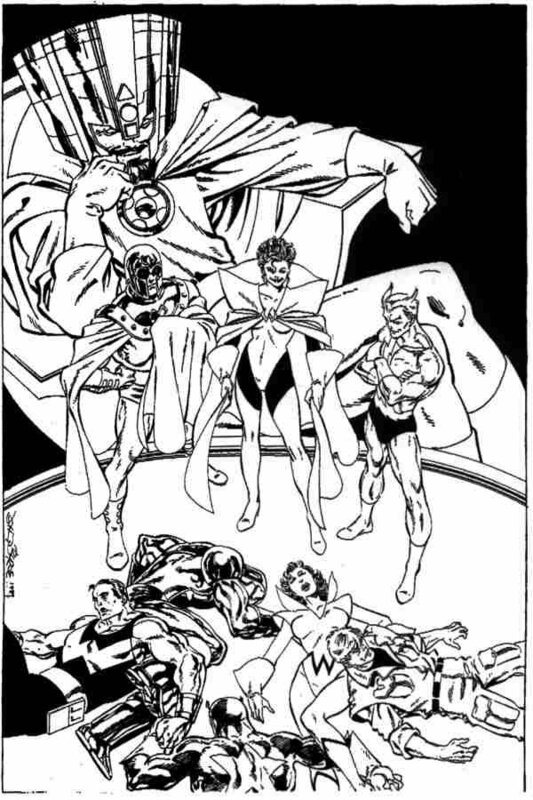 After an overly cute fantasy/bedtime story created by Kitty featuring the X-Men, Claremont and Cockrum launched into their most ambitious story line, the Brood Saga. The StarJammers came to Earth and the X-Men freed Lilandra from her deadly sister Deathbird and her allies the Brood. The story line was interrupted by a few issues which featured the return of Rogue, an attack on Storm by Dracula with beautiful art by Bill Sienkiewitz, and #160 which involved Belasco the Demon Lord of Limbo and Colossus’ little sister Illyana. Issue #161 detailed Xavier’s first meeting with Magneto and helped fill in more of Magneto's character. The Brood story line resumed with issue #162 which was a rehash of the Alien movie plot. The X-Men were impregnated with the eggs of the Brood queen and would die metamorphosing into Brood creatures. 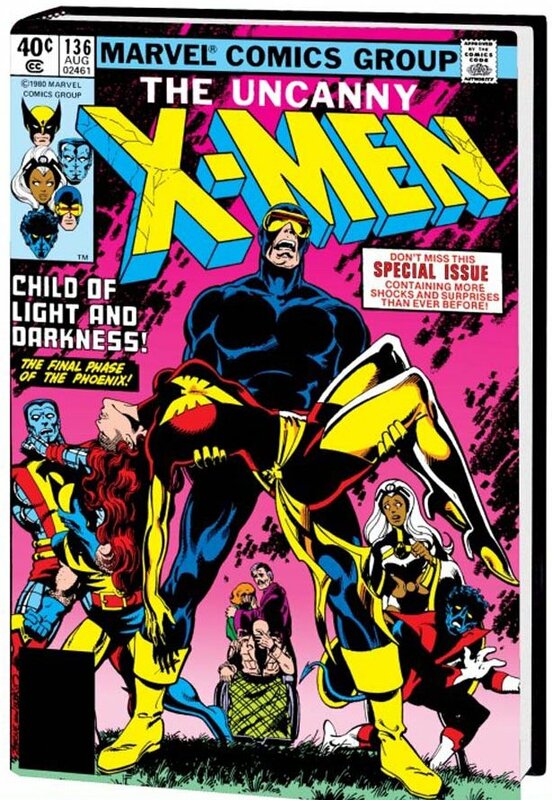 Dave Cockrum never finished the Brood saga as he ends his second run on the X-Men with issue #164. "I stayed through to #107. I couldn't stay with it because I was on staff by that time my job was to design covers and I just couldn't handle it anymore. I was tired and I gave it up. Later on, they asked me to do that Marvel Fanfare with the X-Men in the Savage Land and it was fun! I called up Chris and said, "This is really fun! If Byrne ever wants to leave the book, give me another chance at it." And Byrne left the book that following Monday. That was a weird juxtaposition! So I got the book back and I was enthusiastic again. It was fun for a long time. The only reason I left the book the second time was because I had previously put in a proposal for The Futurians. It sat on Jim Shooter's desk for about a year, and he finally said, "Yeah, you can do this if you want." I was in some doubt whether I should quit the X-Men and do that but I really wanted to do it. Chris and Louise Simonson, the editor, talked me into giving up the X-Men because they thought I was more enthused about The Futurians. That was probably the biggest mistake of my life! That was about the time they started paying the royalties and reprint money. It takes nine months after an issue goes on sale before you get a royalty check so I hadn't received one yet by the time I quit the X-Men. When the first one came it was $2000 right out of the air! I thought, "Geez!" And it got better, and from what I heard, people like Jim Lee were making $40,000 a month on royalties. (That's why they could afford to go off and start Image.) If I had known about that kind of money coming in even the $2000 a month you couldn't have pried me off that book with a crowbar. The Futurians was never that successful." 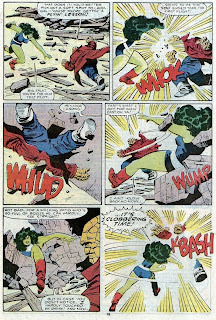 "Don't get me started on Byrne. My opinion of his art is colored by the fact that I think personally, he's an arrogant, first-class jerk. Was I envious of Byrne? Probably a little, because he's frequently touted as being more important to the book than I am. But if I hadn't created Storm, Nightcrawler, Colossus, Phoenix, Mystique, Lilandra, Deathbird, the Shi'ar Imperial Guard and the Starjammers, there would have been an entirely different X-Men book, and possibly no X-Men publishing empire. Possibly even no X-Men book at all. And probably no X-Men movies. 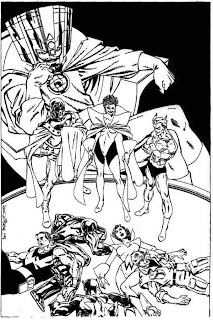 And if, instead of leaving DC I'd stayed on the Legion of Superheroes, we might be watching Legion movies these days. D'OH! A no-prize to readers who can correctly guess the actual issues these unpublished covers were intended for?